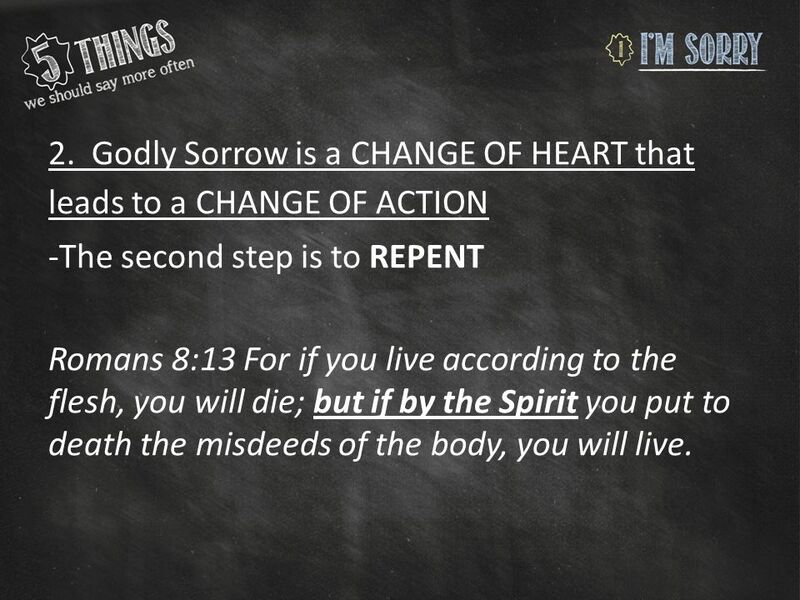 3 Godly sorrow is a change of heart that leads to a change of action that changes your life! 4 2 Corinthians 7:8 Even if I caused you sorrow by my letter, I do not regret it. Though I did regret it—I see that my letter hurt you, but only for a little while—9 yet now I am happy, not because you were made sorry, but because your sorrow led you to repentance. For you became sorrowful as God intended and so were not harmed in any way by us. 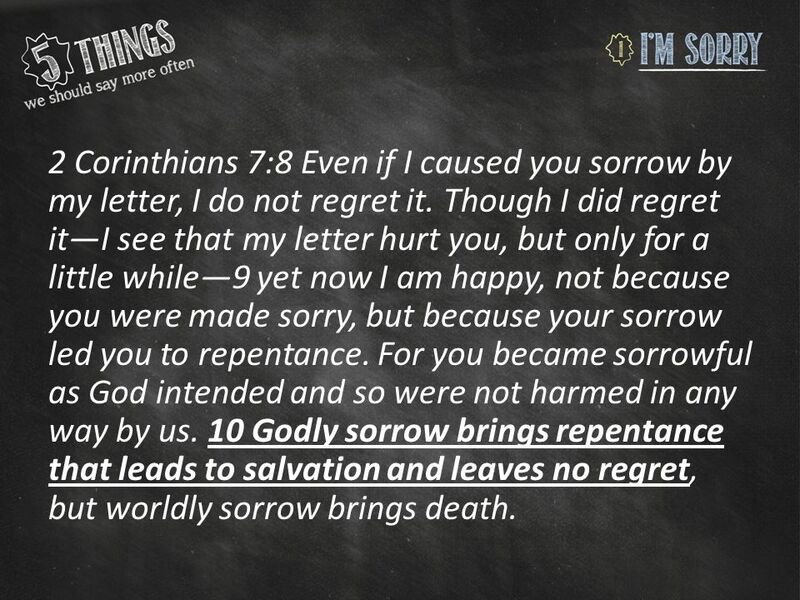 10 Godly sorrow brings repentance that leads to salvation and leaves no regret, but worldly sorrow brings death. 5 11 See what this godly sorrow has produced in you: what earnestness, what eagerness to clear yourselves, what indignation, what alarm, what longing, what concern, what readiness to see justice done. At every point you have proved yourselves to be innocent in this matter. 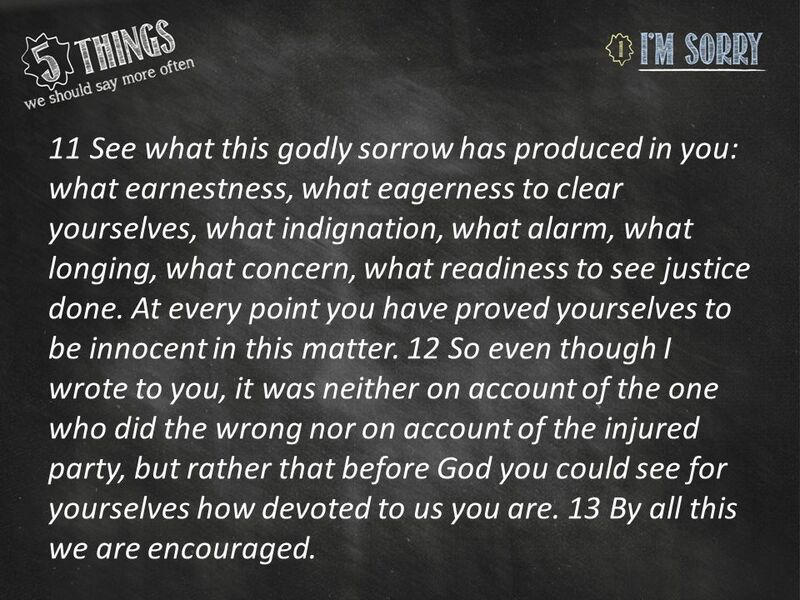 12 So even though I wrote to you, it was neither on account of the one who did the wrong nor on account of the injured party, but rather that before God you could see for yourselves how devoted to us you are. 13 By all this we are encouraged. 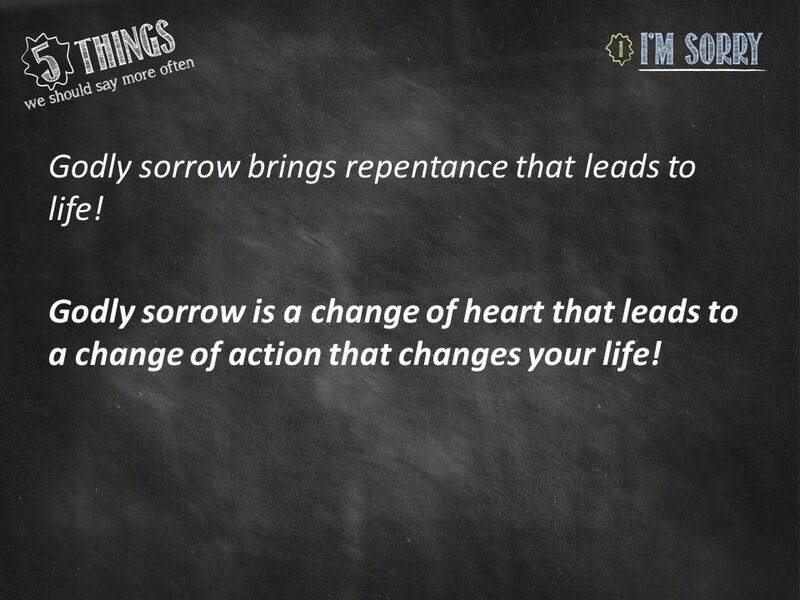 Godly sorrow brings repentance that leads to life! 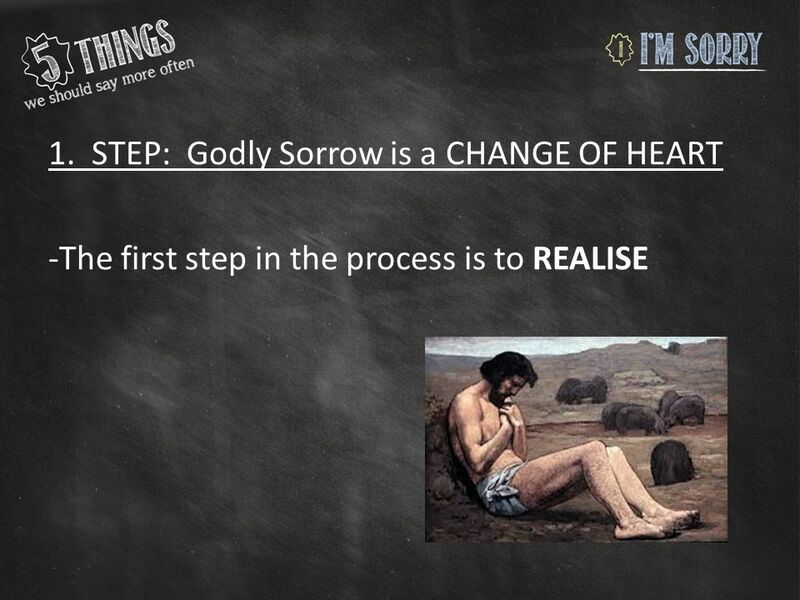 Godly sorrow is a change of heart that leads to a change of action that changes your life! 7 The Parable of the Lost Son Luke 15:11 Jesus continued: “There was a man who had two sons. 12 The younger one said to his father, ‘Father, give me my share of the estate.’ So he divided his property between them. 13 “Not long after that, the younger son got together all he had, set off for a distant country and there squandered his wealth in wild living. 14 After he had spent everything, there was a severe famine in that whole country, and he began to be in need. 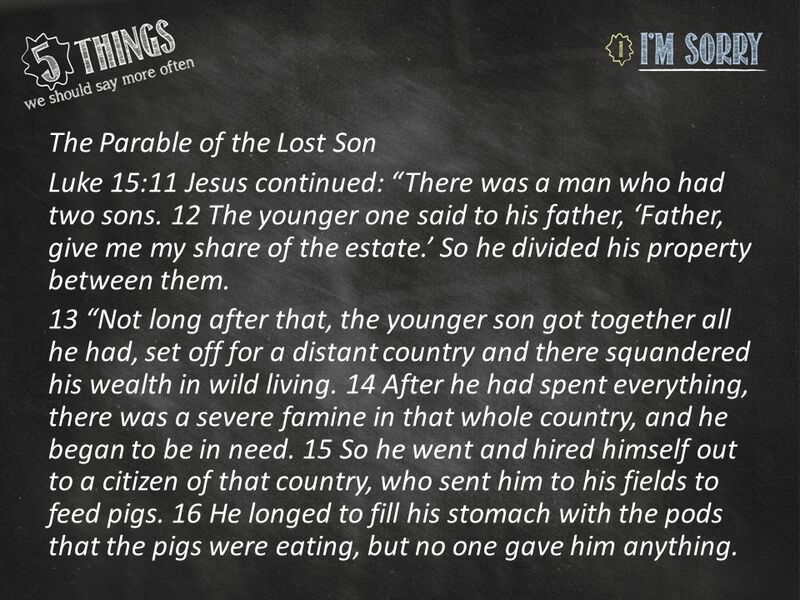 15 So he went and hired himself out to a citizen of that country, who sent him to his fields to feed pigs. 16 He longed to fill his stomach with the pods that the pigs were eating, but no one gave him anything. 8 17 “When he came to his senses, he said, ‘How many of my father’s hired servants have food to spare, and here I am starving to death! 18 I will set out and go back to my father and say to him: Father, I have sinned against heaven and against you. 19 I am no longer worthy to be called your son; make me like one of your hired servants.’ 20 So he got up and went to his father. “But while he was still a long way off, his father saw him and was filled with compassion for him; he ran to his son, threw his arms around him and kissed him. 9 21 “The son said to him, ‘Father, I have sinned against heaven and against you. 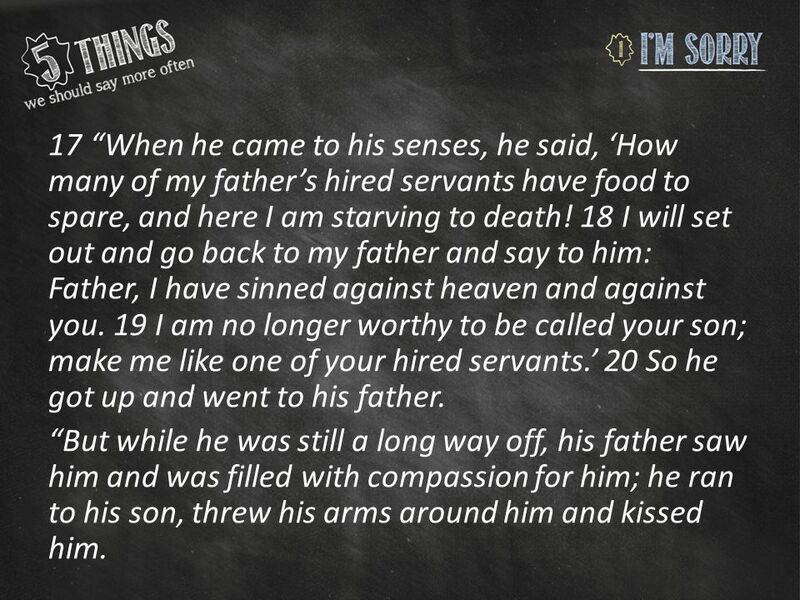 I am no longer worthy to be called your son.’ 22 “But the father said to his servants, ‘Quick! Bring the best robe and put it on him. Put a ring on his finger and sandals on his feet. 23 Bring the fattened calf and kill it. Let’s have a feast and celebrate. 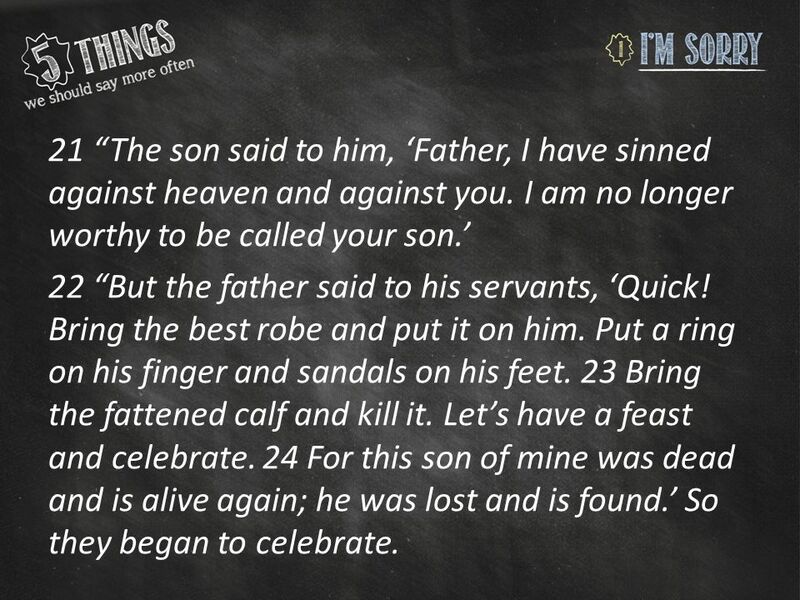 24 For this son of mine was dead and is alive again; he was lost and is found.’ So they began to celebrate. 11 2. Godly Sorrow is a CHANGE OF HEART that leads to a CHANGE OF ACTION -The second step is to REPENT Romans 8:13 For if you live according to the flesh, you will die; but if by the Spirit you put to death the misdeeds of the body, you will live. 12 3. 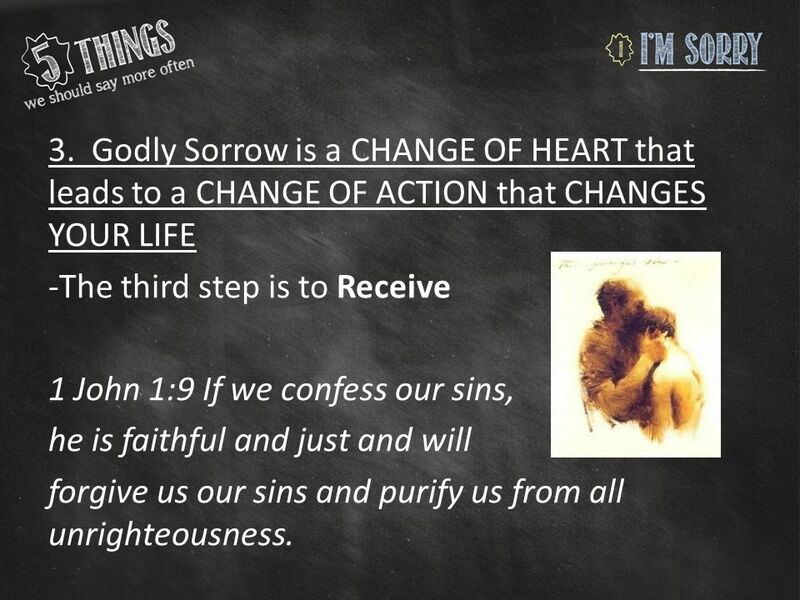 Godly Sorrow is a CHANGE OF HEART that leads to a CHANGE OF ACTION that CHANGES YOUR LIFE -The third step is to Receive 1 John 1:9 If we confess our sins, he is faithful and just and will forgive us our sins and purify us from all unrighteousness. 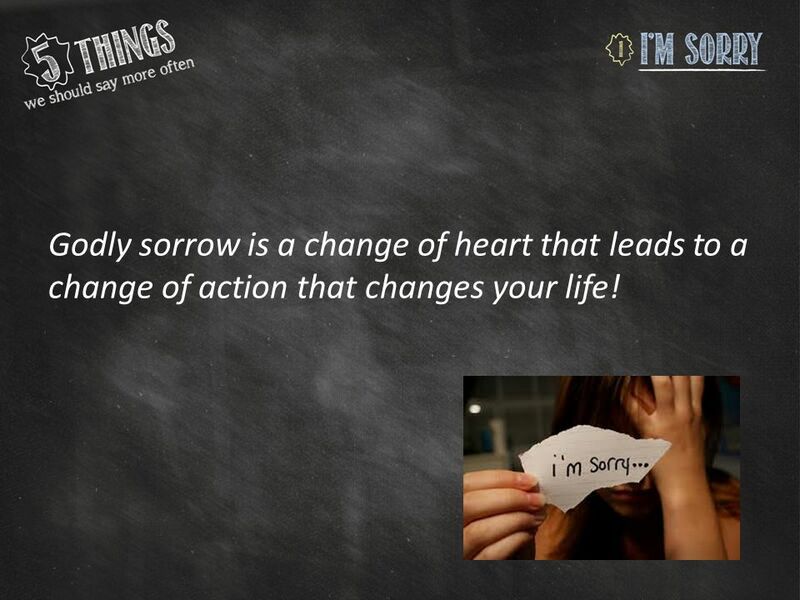 Download ppt "Godly sorrow is a change of heart that leads to a change of action that changes your life!" The Parable of the Prodigal Son Renouncing God. 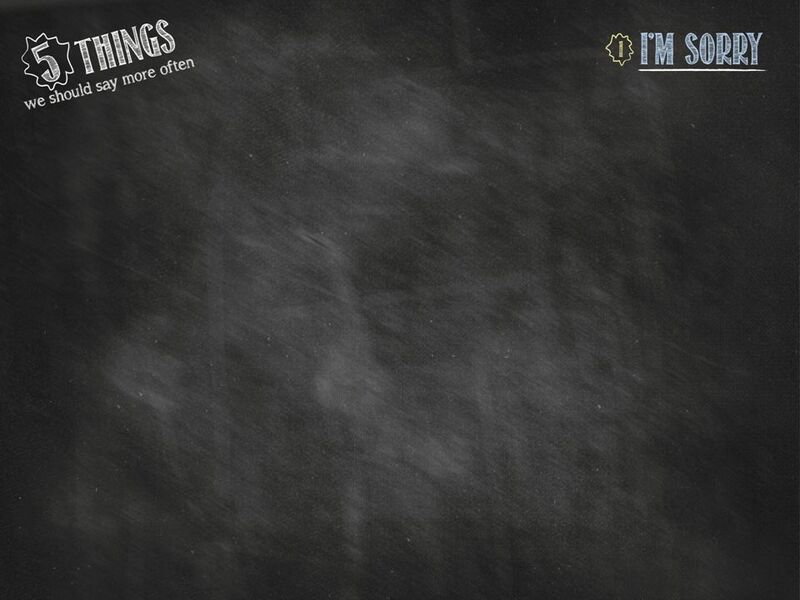 The Context… Jesus had just finished the Parables of… The Lost Sheep The Lost Coin. Prodigal Son A story of love.. A man had two sons. One day the younger son said to his father, Give me the money you plan to give me when you die. HOW TO GET CLOSER TO GOD 50 Days of Transformation Part 1 (Spiritual Health) Pastor Dave Martin ~ Cross Creek Community Church ~ March 2, 2014. 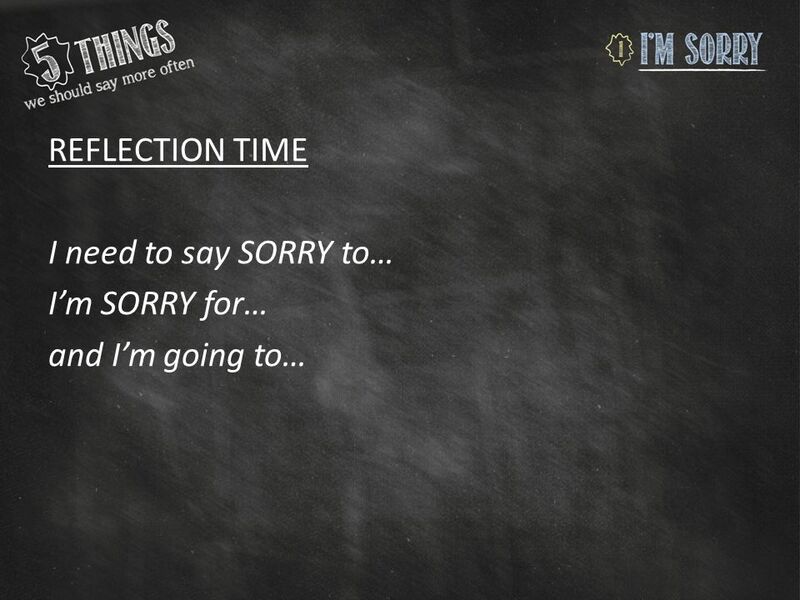 Series Introduction - Kelly Welcome In this miniseries we are discovering the different aspects of forgiveness. 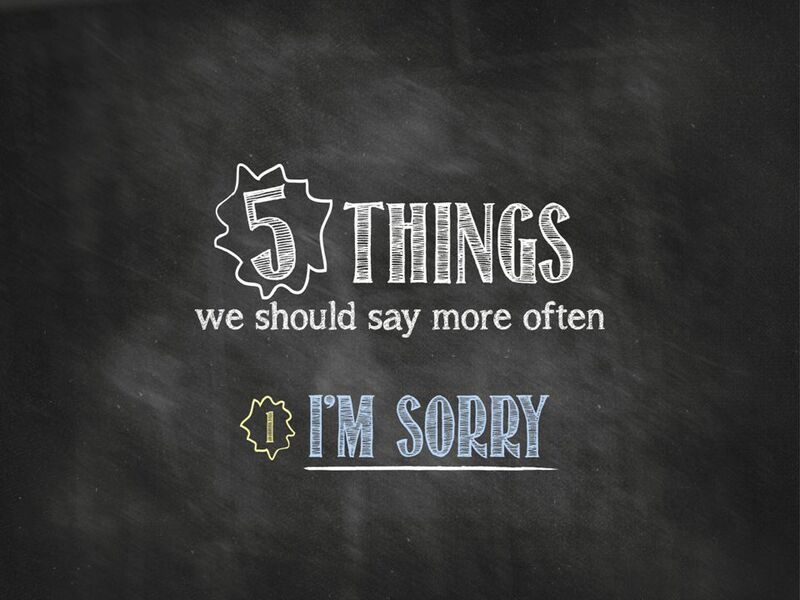 This is our third and final webisode. The Scandal of Grace Luke 15:11-24 Two Common Approaches to God 1.Religion – play the game, follow the rules, conform to a set of values… 2.Irreligion. Grace. The story so far StoryGrace Lost SheepFinding lost Sheep Unforgiving servantAll debts are off Beaten up manHealing half dead Friend at midnightGiving. We Believe… Jesus Sets Us Free Luke 15: We believe… Jesus sets us free.